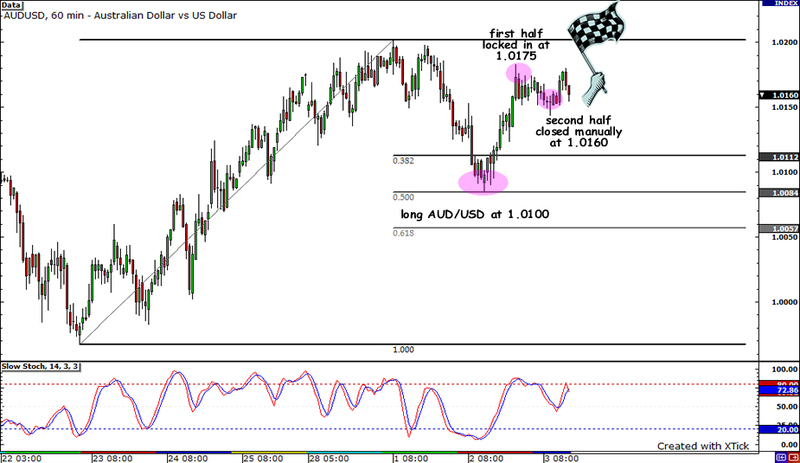 AUD/USD Day Trade: Time to Switch Gears? – PT Hit! My attempt at a day trade was a success! Late last night when I just came home from a party, I saw that Australia’s building approvals report came in worse than expected with a 15.9% decline in January, which is much worse than the 10.0% growth in December. Never mind that its trade balance data came in a bit better than expected at 1.4% in January – my heart was already doing backflips at the positive US ADP report. I had a good entry point with this one as the pair climbed almost steadily just as I entered my order. Good thing I didn’t aim for the 1.0200 handle though, since the pair did encounter resistance at the previous week high and the top daily range at the 1.0175 area. Half of my position was still open when Australia’s data were released, so I manually closed it at a profit at 1.0160. So what did I learn from this trade? Well, I would certainly be more open to day trades now! Maybe sticking to a solid setup on an intraday basis isn’t such a bad idea, especially when fundamental bias changes at the drop of a hat. Also, I was lucky to be around while Australia’s reports were released, but I think that it would be a great idea to watch reports closely so I can lock in more profits. All right, that’s it for me today! If you have any trade ideas you’d like to share or questions you’d like to ask, don’t hesitate to hit me up on Twitter or on the comment box below! After I got burned by that AUD/USD symmetrical triangle breakout last week, I’m switching gears and siding with the bulls this time. Australia just released a strong GDP report, which beat expectations and posted a 0.7% economic expansion for the last quarter of 2010. Although AUD/USD initially dipped during the release because of the downward revision to the third quarter’s figure, growth is still growth, right? I’m inclined to think that traders were probably just expecting too much from the Land Down Under, when its fourth quarter growth is impressive as it is, considering how Australia suffered several floods during that period. Besides, who can resist that sweet setup on the 1-hour chart? After reaching the 1.0200 handle, the pair pulled back and bounced from the 50% Fibonacci retracement level. That’s just a hairline away from the 1.0100 major psychological support level, which has held many times before. Stochastic already crossed and started to crawl out of the oversold area so I pulled the trigger and entered at 1.0100. At first I decided to aim for the previous day high, which was around 1.0200. But then I saw that the previous week high and the top daily range coincided at the 1.0175 area and thought it better to lock in some of my profits there. I also set my 60-pip trailing stop initially at 1.0040, which is below the 61.8% Fib and the 1.0050 minor psychological support. This way I can let the rest of my position ride in case the pair breaks above the 1.0200 mark. As I mentioned before, I’ll be keeping track of the upcoming events to see whether I should exit early or not. For today, all that’s left on deck is the ADP non-farm employment change. Now, this could rock the markets during the U.S. session later on since it’s considered a preview of the upcoming NFP report. For the month of February, private employment is expected to be slightly weaker at 178,000 than in January when landed at 187,000. 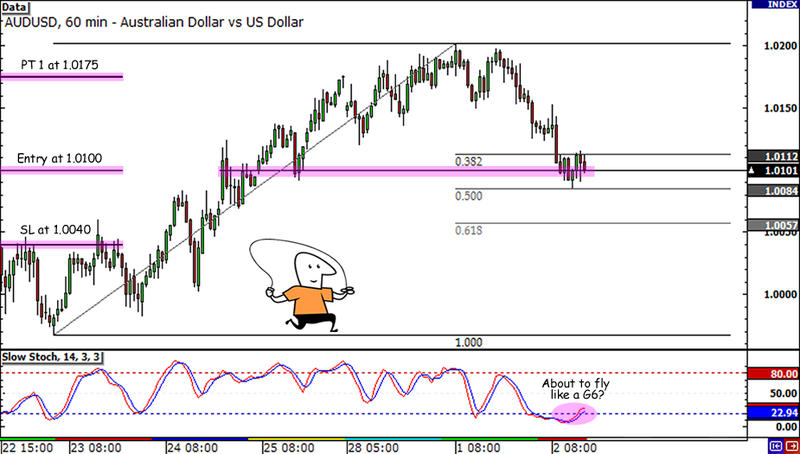 If the actual figure fails to meet expectations, it could trigger some U.S. dollar dumping ahead of the NFP. Speaking of the NFP… I decided to take a shorter-term trade this week precisely because of the potential fireworks from the U.S. labor report. I’ll be closing my trade prior to the release since I’m scared of getting burned again. Besides, Friday night is date night and I don’t want to spend it staring at my computer monitor! The Aussie also has a couple of economic catalysts on the agenda for tomorrow. These are the trade balance and building approvals report, which are both slated to print weaker figures compared to the previous month’s readings. I’ll be keeping a close eye on these reports tomorrow and, if the actual figures disappoint, I’ll exit this trade early. Long AUD/USD at market (1.0100), 60-pip trailing stop (initially at 1.0040), pt1 at 1.0200. I’ll be risking 1% of my account for this trade. I’ll be posting more of my thoughts through my Twitter account and I’m open to hearing your feedback on this trade as well. Hit me up!